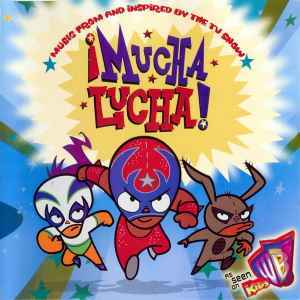 Various ‎– Music From And Inspired By The TV Show ¡Mucha Lucha! Copyright (c) – Warner Music Latina Inc.
Phonographic Copyright (p) – Warner Music Latina Inc.
Phonographic Copyright (p) – Metro Casa Musical, S.A. De C.V.
Phonographic Copyright (p) – WEA Latina, Inc. Published By – Ser-Ca Publishing, Inc. Published By – Warner Music México, S.A. De C.V. Published By – Warner Chappell Music México S.A. de C.V. Published By – W.B.M. Music Corp. Manufactured For – Warner Music Latina Inc.
Soundtrack to Kids' WB series. Motion picture artwork, TM and copyright © Warner Bros. This Compilation: ℗ & © 2002 Warner Music Latina Inc. Warner Music Group, An AOL Time Warner Company. All rights reserved. Manufactured and distributed by Warner Music Latina Inc, 555 Washington Avenue, Fourth Floor, Miami Beach, FL 33139. Printed in U.S.
Track 1: Ser-Ca Publishing, Inc. (BMI) ℗ 2002 Warner Music Mexico S.A. De C.V.
Track 4: WB Music Corp. (ASCAP) ℗ 2001 Metro Casa Musical, S.A. De C.V.
Track 5: Sir George Music (ASCAP)/ Jimmy G's Music (ASCAP) adm. by WB Music Corp. (ASCAP)/ WB Music Corp. (ASCAP)/ Maha Gita Music (ASCAP) ℗ 2001 WEA Latina Inc.
Track 6: Scott & Soda Music (ASCAP) & Follazoo Crew Music (ASCAP) adm. by WB Music Corp. (ASCAP)/ Real Diamonds Music (ASCAP) adm. by Zomba Enterprises Inc. (ASCAP) ℗ 2001 WEA Latina Inc.
Track 7: Warner Music Mexico, S.A. De C.V. adm. by Warner-Timerlane Publishing Corp. (BMI) ℗ 2001 Warner Music Mexico S.A. De C.V.
Track 8: Ser-Ca Publishing, Inc. (BMI) ℗ 2001 Metro Casa Musical, S.A. De C.V.
Track 9: Warner Chappell Mexico, S.A. De C.V. adm. by WB Music Corp (ASCAP) ℗ 2002 Warner Music Mexico S.A. De C.V.
Track 11: Warner-Timerlane Publishing Corp. (BMI) ℗ 2000 WEA Latina Inc.
Track 12: Warner-Timerlane Publishing Corp. (BMI)/ WB Music Corp. (ASCAP)/ Sir George Music (ASCAP) adm. by WB Music Corp. (ASCAP) ℗ 2000 WEA Latina Inc.
Track 13: W.B.M Music Corp (SESAC) ℗ 2002 Warner Music Latina Inc.